All three major U.S. equity indices surged last Friday, erasing losses for the week with the biggest gains in nearly three weeks as Wall Street grew more confident that new Fed Chairman Jerome Powell may not rush to raise interest rates as the economy improves. Stocks surged in the final hour after a policy report delivered to Congress ahead of Powell’s Congressional testimony on Tuesday showed that the Federal Reserve did not appear to be in favor of additional rate hikes beyond the three rate increases previously expected this year. Concerns that the Fed would step up the pace of hawkish intervention rattled markets earlier in the week. Meanwhile, bond investors took solace from the minutes from the European Central Bank’s recent policy meeting, which showed members are not ready to remove a pledge to expand its monthly asset-buying program, if warranted. The S&P 500 rose +1.6% on Friday and up +0.58% for the week, finishing back above its 50-day moving average, while the Dow Jones Industrial Average slightly trailed with a +0.36% gain last week, and the MSCI EAFE (developed international) lost -0.44%. Following one of the least volatile stretches in S&P 500 history, stock market volatility returned this year as stocks fell into correction territory (10% decline) for the first time in two years. Throughout most of 2017 equities steadily traded higher, with the S&P 500 index infrequently trading outside of its typical 1% daily range. 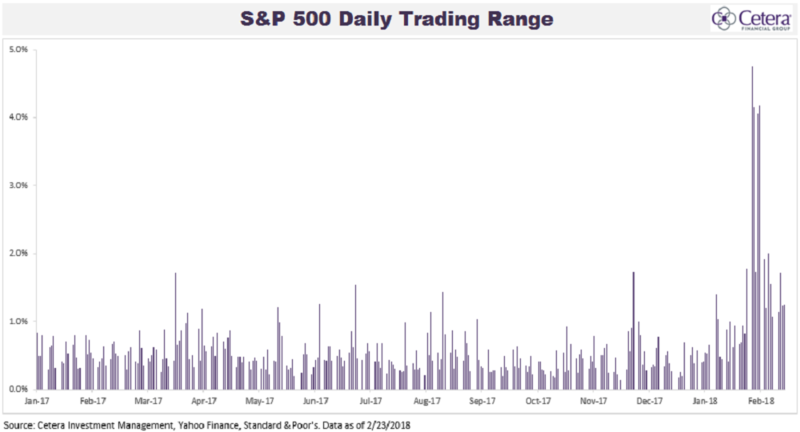 Volatility picked up between February 2 and February 23, as the S&P 500 traded within a daily range of over 1% on 15 consecutive trading days. The last time we saw similar ranges was in early 2016, during the last market correction. Notably, the S&P 500 traded within a daily range of 4% or higher four times in five days in early February, which has not happened since August 2011. Historically, this level of stock market volatility is not a rare occurrence, as the S&P 500 experiences a correction of at least 10% during most calendar years. While the February experience is normal, it comes after an unusually long period of calm in the markets. In our view, this is not an isolated event, but likely a return to a period of elevated stock volatility. We recommend maintaining a diversified portfolio, as well as an allocation to alternative investments, in order to help limit downside risk in volatile times. We also note that market selloffs can provide opportunities for investors who have cash on the sidelines to re-enter the markets at a lower valuation.